1. Being gay is most certainly not in the same category as making sexual advances on a minor. Are you, Kevin suggesting otherwise? 2. But, would it have been a bit tricky to apologise for this story potentially being true without being open about the fact that coming on to a male (of any age) could have definitely happened? 3. ‘Inappropriate drunken behaviour’ again, is not the same as paedophilia is it? 4. Does describing this as ‘drunken behaviour’ suggest that this has happened / could happen again if drunk? That’s not ok.
5. Are you suggesting that making ‘sexual advances’ towards a minor is the same as ‘making sexual advances’? It isn’t. 6. At some point, Kevin, do you think you might have to acknowledge that this kid was 14 and explain whether you knew this at the time or found out later and respond to that particular issue? 7. 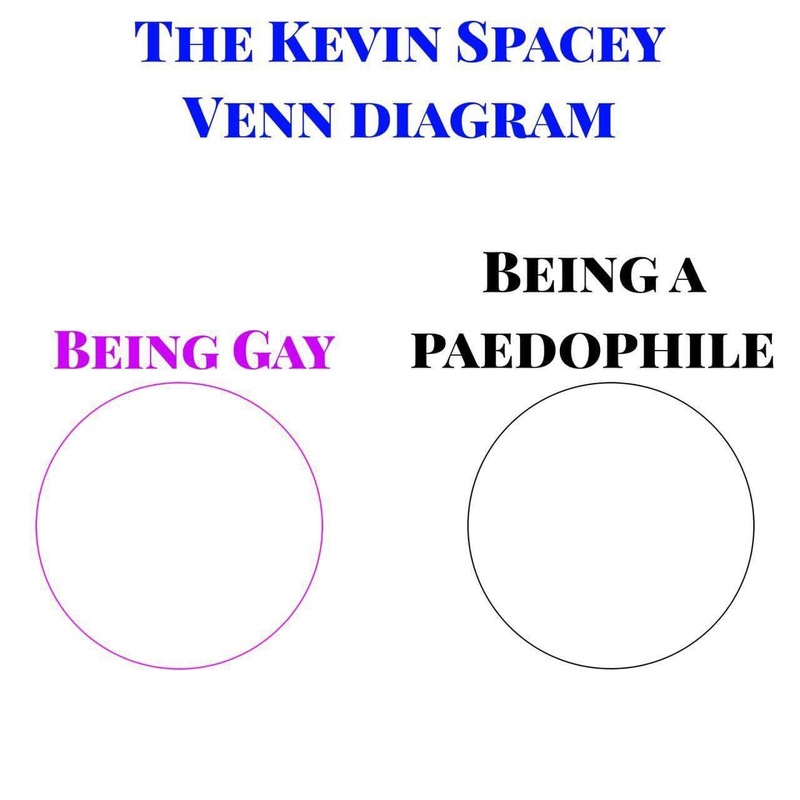 Perhaps we the consumer of this news should consider whether a short statement is too surface-level to fully ascertain whether Kevin Spacey knew this kid’s age at the time or not, if he remembers the occasion even vaguely or not, whether this was a very clumsy way of apologising and also having by default to come out about his sexuality and wait for further (expert) development of the story / case? 8. At the very least, could we be thankful he didn’t accuse the victim of lying or victim-blame in any way? At least he acknowledged the anguish he’d carried with him for his entire adult life. 9. Does anyone think that preying on a child is the same as coming on to a man? 10. Does anyone disagree that fancying men is not the same as fancying minors? 11. Did it not occur to Mr Spacey for one second that it would be really bloody unhelpful to link sexuality with sexual assault or sexual abuse?! 12. Did I mention that paedophilia is not the same as homosexuality? The more questions we ask, the more we realise that so many more need to be asked. And I for one hope to see these addressed sooner rather than later.